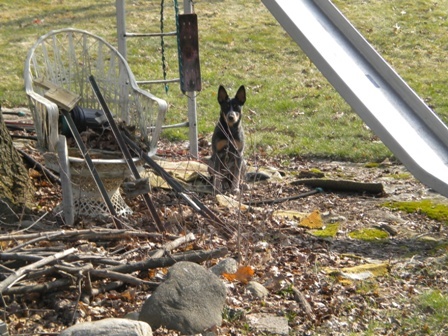 It's spring time here at the Marsh and our puppy is growing. 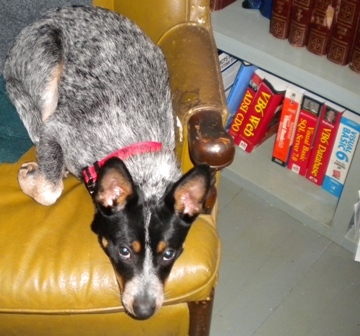 She is about 35 pounds now and if standing on hind legs, in dancing position - is close to 4 ft tall - which is a far cry from the itsy bitsy handful she was back when we first met her. She is showing us how smart she is, while at the same time trying to rule the roost... but is finding that she loses that battle. Ziva and the 4 kitties get along much better now, although they occasionally tussle. Ziva gets to go with Shari on her morning walk - about 6 miles each morning. Her buddy Chester - an older cocker spaniel brings along Shari's friend Tammy. The two of them... 'er the 4 of them wander the streets in the early morning listening to the birds and other critters, while enjoying a bit of exercise. 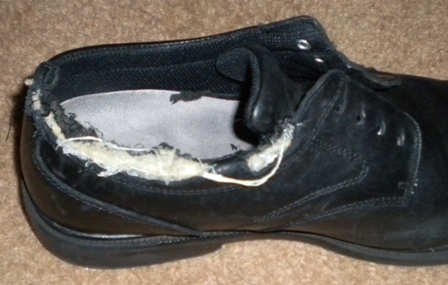 I guess I needed new shoes. Ziva thought so. So what we've learned is that "Z" isn't ready to manage herself during the day and is now back to her crate for times we are away from home. 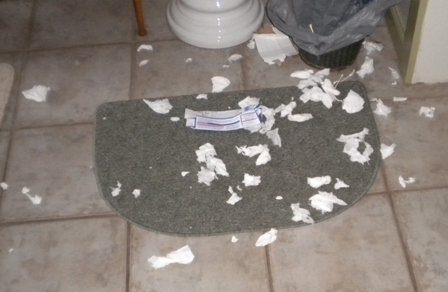 Does that mean she is an angel when we are at home... ha ha - you had to know that answer would be no... as the following pic, attests. Besides the morning walks - Ziva has lots of places to spend outdoor time. The Marsh has much to explore, including long-legged visitors: Sand Hill Cranes - of course, she cannot catch them and we wouldn't let her anyway as she is leashed here until she learns 100% to stay with us. 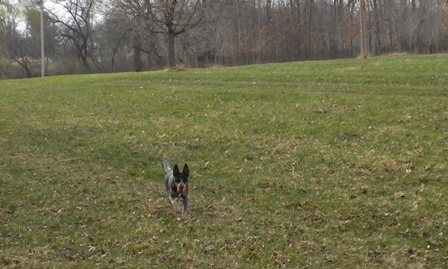 Ziva has this habit of wanting to run toward the road and we don't need a squooshed 'Z'. The following 2 pics were taken here at The Marsh. I help in the gardens. Yes I do. Ziva has been on many car rides and has been perfect in all of them. She will look around for the first few miles, but then just curls up and sleeps. No barking, no scratching, just calm... we expected that would come over time, but that's how it was from the day we picked her up on the cold and snowy December day. 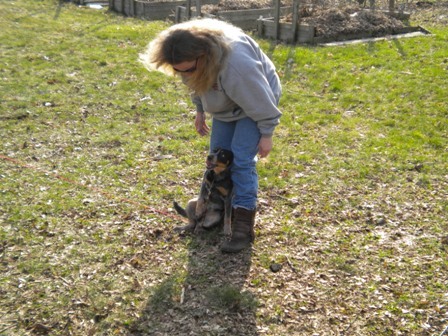 Our neighbors & friends, Charlie & Cindy own a 100+ acre tree and shrub nursery and Ziva has play privileges there. And because of its size, we can be comfortable allowing 'Z' to roam free off leash. She likes to chase the Frisbee and ball. Remarkably, she is always close by - never more than 20-50 ft, unless we toss the ball farther. We don't play tug o' war with her - in fact, we ignore her if she tries to do that. She is even getting pretty good at releasing the ball or Frisbee "when" we have it in our hands - although getting her to bring back and drop at our feet, still needs some work. By the way... when playing fetch with Ziva - you cannot let your mind wander, as Ziva gets a bit jubilant on her run back and has been known to run into us. Shari was knocked over once, and I was kneeling down once ready to give her big hugs for returning to us with the ball - but totally mis-judged her speed and nearly fell over when she slammed into my arms. 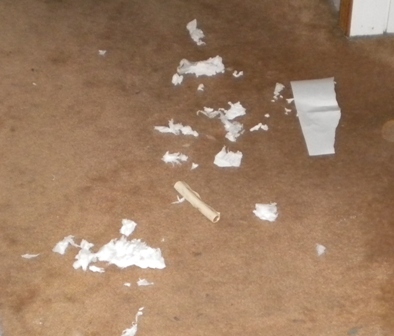 We have learned this is part of her herding instinct and knowing this, we do our best to stay focused and prepared. 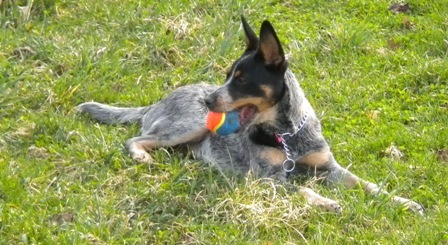 Next week, Ziva gets to go visit "Auntie Janice", so she can play with Bertie - another Blue Heeler. Ziva visited with Bailey and Bertie at Christmas as a little munchkin - and she of course couldn't keep up. 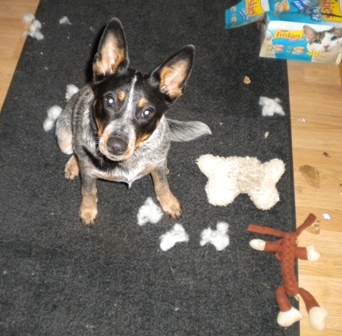 Bailey was Janice's Red Heeler, who we baby sat about 10 years ago and she showed us the power and brains of the Heelers. 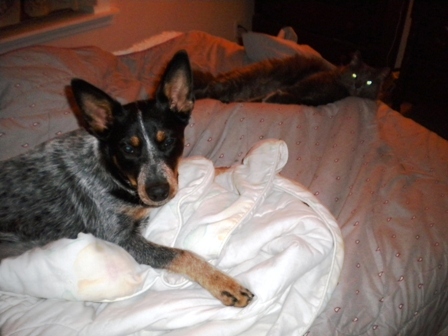 Recently, Bailey passed on, so Bertie and Ziva are now occasional playmates. Ziva says - have a happy summer. She hopes to learn many new things over the next several months and she will check back in about harvest time.